A logical, straightforward approach to learning the C# language C# is a complicated programming language for building .NET-connected software for Microsoft Windows, the Web, and a wide range of devices. The friendly All-in-One For Dummies format is a perfect way to present it. Each minibook is a self-contained package of necessary information, making it easy to find what you're looking for. Upgrad… es in C# 2010 include the ability to build Windows 7 applications and compatibility with Python and Ruby. 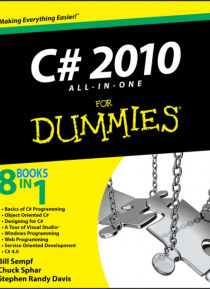 C# is a somewhat complex programming language for building .NET-connected software for Microsoft Windows, the Web, and other devices Beginning C# programmers will appreciate how the All-in-One format breaks the topic into minibooks, each one addressing a key body of information Minibooks include creating your first C# program, Windows 7 programming, basic C# programming, object-based programming, object-oriented programming, Windows programming with C# and Visual Studio, and debugging Companion Web site includes all sample code Beginning C# programmers will find C# 2010 All-in-One For Dummies explains a complicated topic in an easy, understandable way. Note: CD-ROM/DVD and other supplementary materials are not included as part of eBook file.